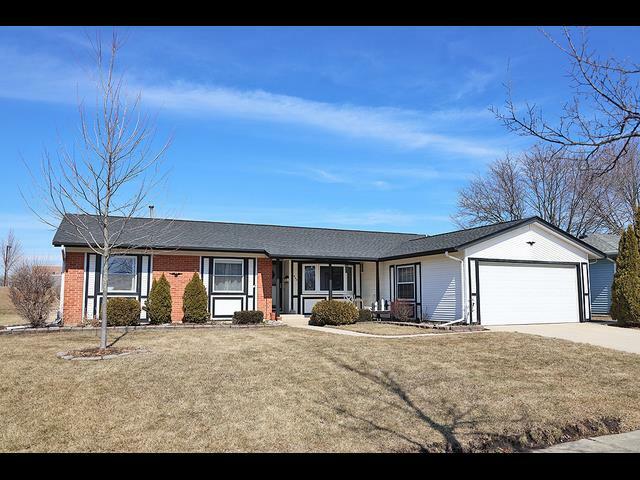 Easy one level living in this spacious ranch style home. New tear off roof plus vinyl siding! Newer quality windows throughout including a bay window in the living room. Generous room sizes so entertaining will be a breeze here. Freshly painted interior. Kitchen was remodeled with wood cabinets, Corian counter, pantry and planning desk area. Kitchen has the open floor plan concept. Baths were updated and the furnace and central air are newer. Home has a separate utility room with sink and more cabinets. Beautiful glass room off the family room and master bedroom. No neighbors behind. Walk to shopping, movies, library, restaurants, Pavilion fitness center and Busse Woods. Easy access to all major expressways and Woodfield. ***HMS Warranty Included*** Note taxes don't include homeowner exemption but correction is in process.